Step 2: figure out what you REALLY want, and why. If you’ve followed the goal setting steps thus far, you should have a pretty good-sized list of stuff you want, things you want to accomplish, the kind of person you want to be, and how you’re going to take care of yourself along the way. If you don’t have much of a list, that’s okay. I’ve seen students do this exercise where they write down a few things and are done. They don’t have a high need to do a ton of things, and are pretty happy with their current goals. In some cases, people don’t plan much of their life beyond about 5 years out. That’s okay too. Most business planning is useless beyond 5 years because the world has changed so much during that time that what was relevant back then, is now outmoded. Your next step is to sort through your list and determine what you really want. Do this through force prioritization. In force prioritization you assess the first thing on your list and compare it to the second thing – figure out which you want more. Then you take the “winner” of that competition, and compare it against the third thing. You take that winner and compare to number four – and so on, until you’ve got a pretty good idea of your top priorities. You can also toss aside this process and just identify, in the list, what is pulling you, rather than what you’re pushing yourself towards. If you feel drawn to something, then that’s probably a good indicator you should head that direction. At this point, focus on the goals that you really want to achieve this year. You should only have about 3-4 of these and definitely no more than 5. Leave the rest on the list and decide that you will revisit those later if you have time. I’m going to recommend an Anthony Robbins technique here – for each of your top goals, write down what – specifically – you want to achieve (i.e. what does success look like) and WHY it’s important for you to achieve it. As Robbins’ says, give yourself the pleasure and the pain. What do you get by achieving the goal, and what will you miss by not achieving it. 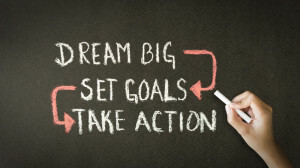 Then, for each of these goals, write down the benchmarks that need to be achieved in order to achieve the overall goal. This is the critical path. Add a timeline to the benchmarks. As I tell my flight students, you may not be able to ensure an airline hires you at a specific time, but you do have some control whether you’ll be in a position (i.e. qualified) to be hired by a certain time/date, based on how much you fly and what flight certificates you achieve. From these benchmarks, write down specific, weekly and daily action items that you must take in order to achieve the long-term goal. For a pilot, this may be a certain number of flight hours per month or week. For a management major, this may be a certain number of hours studying towards an industry certification, of if you’re building relationships towards a job, a certain number of contacts you need to make that week. For me, since I’m a writer, I have a word count that I have to obtain per book or project that I’m working on. Through this, I establish what the FranklinCovey group calls a cadence of accountability. I can tell at the end of each week whether I’m ahead or behind on my goals, and make adjustments as necessary. IMPORTANT REMINDER – these last two steps are critical. You need to have specific, actionable items (stuff you can do and check off when done), and you need to establish a system to determine whether you’re on track. Next up, preparing for the journey to ensure your success.